Figure 1. 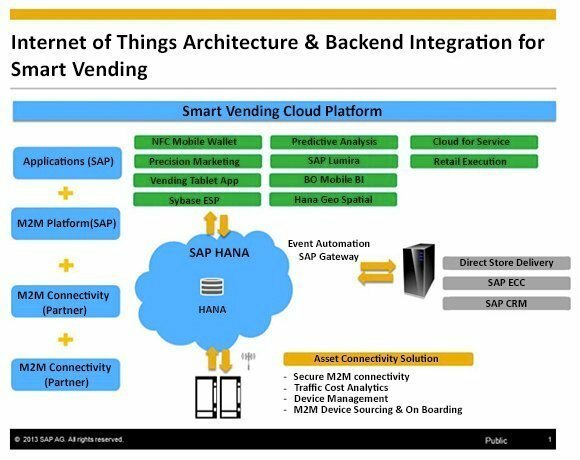 SAP's smart vending architecture. A lot of people are talking about machine-to-machine technology these days, and the ability for devices to communicate with each other without assistance from people. One of the more interesting ways the technology is being used is SAP's take on so-called "smart" vending, which combines the M2M hardware with SAP software to help companies gauge machine inventory levels without a representative having to service the machine. That includes the ability to predict demand -- and when a particular item within the machine is expected to sell out -- with SAP predictive analytics. In this video, Kijoon Lee, vice president of technology and innovation marketing at SAP, explains the cool factor behind smart vending, and how the various SAP applications, shown here, all fit together. He is joined by Christian Busch, senior technology innovation leader for M2M at SAP Labs.